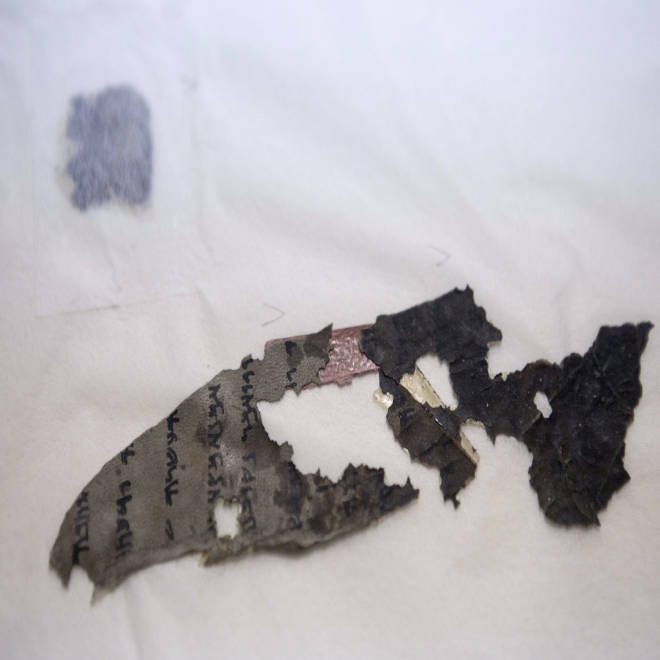 A damaged fragment of the Dead Sea Scrolls lies in Israel's scriptural repository. For years, fragments from the 2,000-year-old Dead Sea Scrolls have been sold quietly to evangelical Christian collectors and institutions in the United States — even though Israel regards those sales as illegal. Now the transactions, and the frictions associated with them, have come under an international spotlight. One big reason is that the scraps are so valuable, in financial as well as archaeological terms. The reported price tags for the fragments range up to $35 million or more. All those texts could shed new light on the origins of Jewish scriptures, ranging from Genesis and other books of the Bible to the messianic rules that were laid down by the mysterious community behind the scrolls. "They are really small pieces, but they are important because you may have two or three lines that may have not been found anywhere else. And suddenly it adds a lot to the history of the Dead Sea Scrolls. There is at least one rather amazing discovery in one of them," Jerry Pattengale, who oversees 12 fragments of the Dead Sea Scrolls in the privately held Green Collection, recently told The Associated Press. Pattengale declined to discuss the discovery further, saying that he had to wait until the finding was published. Many of the fragments sold on the private market come from William Kando, a Palestinian Christian whose family has held onto a collection of pieces from the Dead Sea Scrolls for decades. Kando's father, Khalil Eskander Shahin, was a Bethlehem cobbler and antiquities dealer who bought and sold some of the Dead Sea Scrolls after the initial discovery by Bedouin shepherds in 1946. During the 1967 Middle East War, Israel seized thousands of scroll fragments that were held in east Jerusalem. Under pressure from Israeli authorities, Shahin (who came to be known by his nickname, "Kando") sold the Israelis a 26.7-foot-long (8.15-meter-long) scroll of parchment that was hidden in a shoebox beneath a floor tile in his bedroom. That manuscript, which describes the construction and operation of an idealized Jewish Temple, is known worldwide as the Temple Scroll. 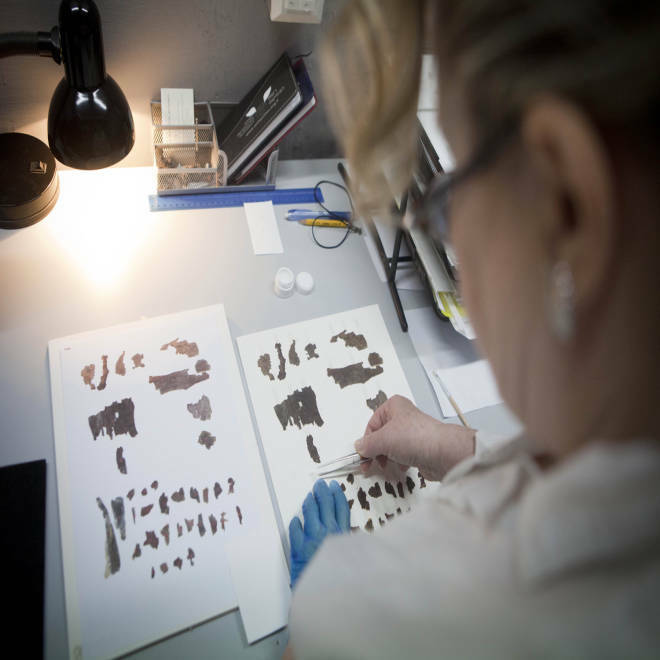 An Israel Antiquities Authority employee works on fragments of the Dead Sea Scrolls in Jerusalem on May 10. Written mostly on animal skin parchment about 2,000 years ago, the manuscripts are the earliest copies of the Hebrew Bible ever found, and the oldest written evidence of the roots of Judaism and Christianity in the Holy Land. 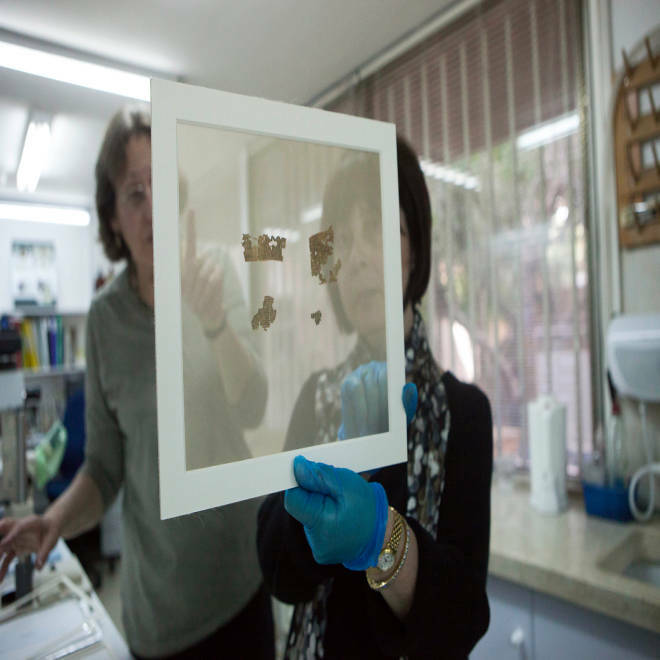 Lena Libman, right, head of the Israel Antiquities Authority's Dead Sea Scrolls Conservation Lab, holds fragments of the Dead Sea Scrolls in Jerusalem. 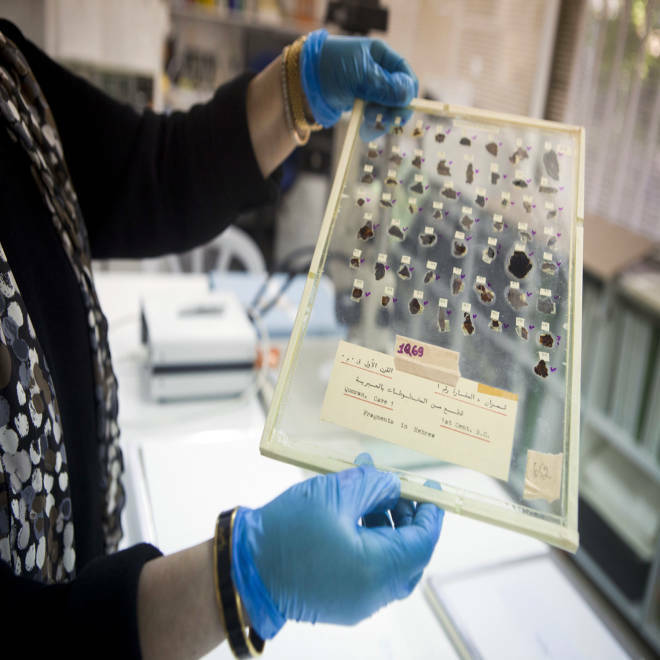 Lena Libman, head of the Israel Antiquities Authority's Dead Sea Scrolls Conservation Lab, holds up fragments of the Dead Sea Scrolls. Many of the fragments are the size of postage stamps. A worker with the Israel Antiquities Authority photographs pieces from the Dead Sea Scrolls in Jerusalem. The elder Kando had many more fragments hidden away, and those were eventually transferred to Switzerland, his son told AP. After the father's death in 1993, the sons began selling off the family collection. Through a series of sales, fragments ended up in the hands of such institutions as Azusa Pacific University, an evangelical Christian college near Los Angeles; and Southwestern Baptist Theological Seminary in Fort Worth, Texas. Randall Price, founder and president of the Texas-based World of the Bible Ministries and a professor at Liberty University in Virginia, said he met with William Kando in 2010 and discussed the sales of the fragments. "He is very insistent that the remaining fragments go to institutions that deal with the Bible so that they can be shared with Christian believers," Price wrote afterward. Kando told AP that he offered to sell the remaining fragments in the family's collection to institutions in Israel, including the government's antiquities authority — but that they couldn't afford to buy them. "If anyone is interested, we are ready to sell," he said. "These are the most important things in the world." Israeli authorities are reportedly interested in one scrap in particular: a well-preserved, butterfly-shaped fragment of Genesis that's about the size of a cereal box. The manuscript, which was recently exhibited at the Fort Worth seminary, includes passages that tell the story of Joseph and his "coat of many colors." Price said that fragment was valued at $35 million or more, but Kando told AP that his family is not participating in any new negotiations for scroll sales. He said the Genesis fragment and the other scrolls that remain in the family's possession are currently locked away in a Swiss safe-deposit box. The Israeli government, meanwhile, sees the scrolls and other ancient Jewish texts as cultural treasures — and in recent years, authorities have clamped down on what they regard as illegal sales. 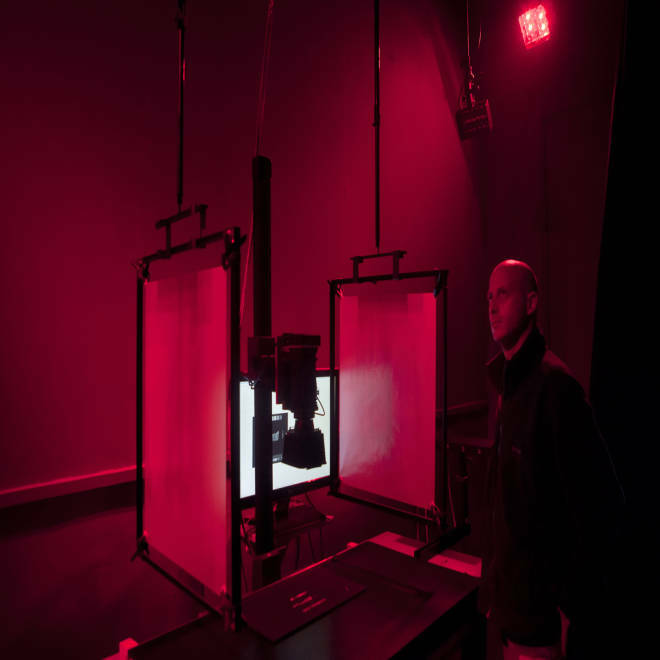 More than 10,000 fragments of the scrolls are being studied in a climate-controlled, government-operated lab in Jerusalem. The Israel Antiquities Authority wants to see Kando's fragments added to that collection — but says that his asking price is too high. It's threatening to seek the seizure of any pieces that hit the market. "I told Kando many years ago, as far as I'm concerned, he can die with those scrolls," Amir Ganor, head of the authority's anti-looting squad, told AP. "The scrolls' only address is the State of Israel." Is mystery of scrolls' authorship solved?